If you feel confused by Star Wars: Battlefront 2’s layered systems, Star Cards and all the rest, you’re not alone. Fortunately, we can help with that. The progression system in Star Wars: Battlefront 2 was heavily criticised during the beta for doing away with traditional, merit-based unlocks in favour of more randomised rewards that require heavy investment in the Star Cards system. DICE promised to make changes in the final version, but things aren’t really that much different, as you’re about to see. Whether or not you agree with the studio’s take on progression in Battlefront 2, what we’ve ended up with remains unnecessarily complicated. Now that the game is more or less out in the wild, thanks to the EA and Origin Access trials and the release of the Deluxe Edition, we can take a closer look. If you’re after more tips, we have advice for class choice, Starfighter combat and more. Battlefront 2 is definitely not the first game to have ability cards, but the way they’re implemented affects a large part of how you play the game. So join us as we explain how the entire process works below. How does the levelling system work? Star Wars: Battlefront 2 has a bit of a unique levelling system. You gain a profile level the more you play – comparable to ranks in Battlefield, and Call of Duty. Anything you do pushes you forward, so there’s not much new there. However, what is different is that your profile level does not dictate what unlocks you get for the various classes. Once you reach certain thresholds, gaining new levels stops being meaningful. Your profile level also dictates the Star Card tiers you will be able to craft – or rather, upgrade to. We’ll explain Star Cards in more detail below, but just know that you’re able to upgrade them through the different rarity tiers. These upgrades are level-gated. You can upgrade a Star Card to level two (green) only if you’re level ten or above. Level 15 or above is needed to upgrade cards to three (blue), and level 20 or above for the fourth and final tier (purple). Beyond that, the only reason to grind levels is for the Credit rewards you get every time you reach a new rank. The next part of the levelling system is Card Level. The different trooper classes, heroes, starfighters and hero ships each have their own Card Level in Battlefront 2. It’s very important to understand that, unlike Battlefield, playing a class does not earn you any “class level.” The only thing you earn by playing as, say the Assault for five hours, is progress towards your next weapon unlock. Unfortunately, all weapons are tied to a specific number of kills you must get before unlocking them. Every class starts with a free weapon, but unlocking the rest requires anywhere from 50, to 500 kills at the top end. If you’re not getting kills, you’re not making progress. You improve your favourite weapon’s effectiveness by crafting modifications, but those are tied to specific Milestones, read: challenges. You can keep track of each of their requirements through the Career menu under Troopers. Spoiler: they’re mostly just “kill X number of enemies” with the weapon in question. Every trooper and ship class in Battlefront 2, along with all heroes and their ships, each have their own separate Card Level. Card Level is calculated based on the number of cards you’ve unlocked for each respective class, as well as their rarities. Think of it as a collector’s score like what you’d find in a card game. The more powerful cards you have for a hero / class, the higher their level is going to be. Card Level is important because it controls two crucial things. First, a higher Card Level will allow your class to equip more cards, up to a maximum of three. Everyone starts with one slot, and you unlock the second at Card Level five, and the third and final one at level ten. Once again, it’s worth stressing that this has nothing to do with how long you’ve been playing as that class. 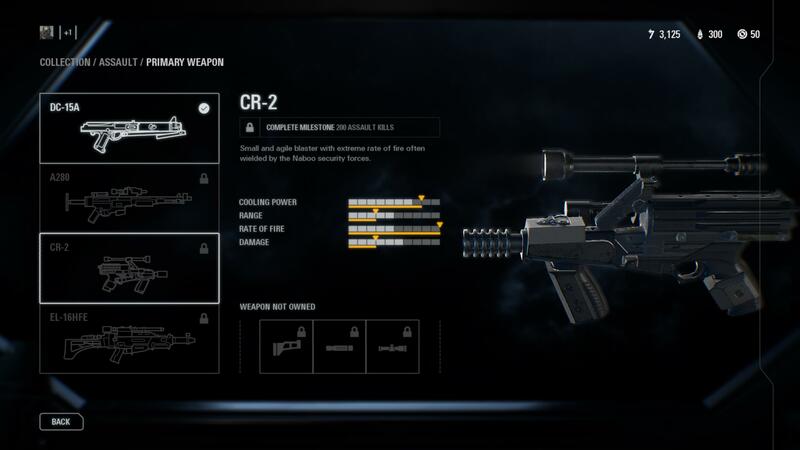 If you get lucky and find, say four rare Assault cards in a crate, that class’ level will instantly shoot up. It doesn’t matter if the cards are equipped or not, or that you don’t actually want to play as that class. So long as you’ve unlocked them, Card Level for that class will be increased. The other thing the Card Level controls is being able to upgrade cards into the higher tiers as we’ve explained earlier. The real powerful stuff requires a high profile rank, as well as a high Card Level for this or that class. Star Cards are the lifeblood of Battlefront 2. They’re in everything, and you can’t ignore them. You earn Star Cards in crates, which you purchase either using the in-game currency Credits (earned from levelling up, completing challenges, etc) or through the paid currency Crystals. 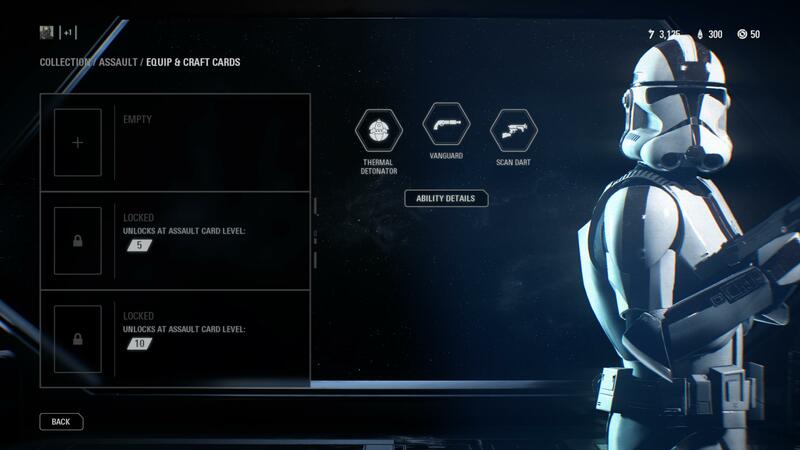 You can also craft the Star Card you want outright using Crafting Parts – the third and final currency. This is the same currency you’re going to need when you want to upgrade said cards – assuming your profile and Card Level allow it. Crafting Parts can’t be bought, you either get them randomly in crates, or as a reward for completing one of the many challenges across campaign, Arcade, multiplayer and so on. Check the Career menu to see the ones that award Crafting Parts when completed. Back to Star Cards, you’ll find two types of them: Boost Cards and Ability Cards. The different classes, starfighters, heroes and hero ships all have Boost Cards. 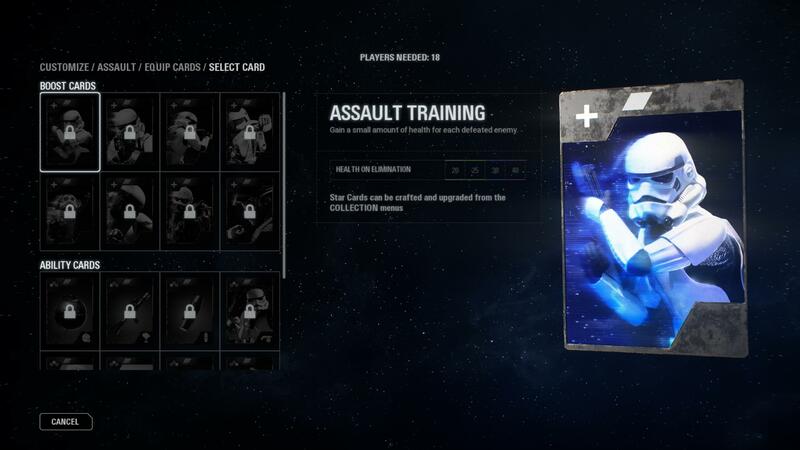 Ability Cards are only available to the four main infantry classes (Assault, Heavy, Officer, and Specialist). Boost Cards upgrade the effectiveness of your main abilities or buff your stats. Things like increased damage, reduced cooldown and so on. The higher the rarity tier, the better the effect. These cards aim to always improve your class, so there are no trade-offs. Ability Cards, on the other hand, replace one of your abilities, either with a completely new one (Ion Torpedo instead of Impact Grenade), or a modified / upgraded version of one of the core abilities. You’ll be making choices such as sacrificing mobility for an increase in DPS with Ability Cards. As such, they require a bit more consideration. Some of the heroes are arbitrarily locked. Darth Vader, and Luke Skywalker initially cost 60,000 Credits to unlock in the first few days, but DICE has subsequently lowered the prices after fan outrage. After the change, Vader, and Skywalker will now cost 15,000 each. Chewbacca, Palpatine, and Leia cost 10,000 each, with the cheapest being Iden Versio at 5,000 Credits. You may find Star Cards for them in crates, but they’ll be of no use until you cough up the required Credits to unlock them. That said, they’ll still be in that hero’s inventory for when you do unlock them. One other thing to note is that although you have three different crate types (Trooper, Starfighter, and Hero), you’re only guaranteed one or two cards for whatever it says in the name. So, a Trooper Crate only guarantees one or two Trooper (any class) Star Cards and an assortment of random items, including Star Cards for starfighters or heroes. Right now, the cheapest is the Hero Crate at 2,200 Credits, or 110 Crystals. The Starfighter Crate is a bit higher at 2,400 Credits, or 120 Crystals, but it’s a lot cheaper than the Trooper Crate. You should probably spend your early earnings on the Starfighter Crate to get a feel for the system. Even if you don’t play Starfighter Assault, you may still end up with a bunch of Trooper Star Cards anyway. There’s really nowhere else to spend the Credits and Crystals you earn from playing and completing Milestones, so you may as well get a few crates.